What is the first thing that comes to your mind when you think of a Calendar? Important dates, tasks, meetings, holidays, or merely a thought of being efficient and organized. Well, each one of us may think of a unique answer, but at the end of the day – we all aim to become productive, well-planned and prepared! A Canadian-American motivational public speaker and author, Brian Tracy wrote in his book, “10 – 12 minutes invested in planning a day saves at least 2 hours of wasted time and effort throughout the day.” All of us would agree to this. In today’s fast pace work environment, each one of us wants to achieve more in less time. Being highly productive and result-oriented is all that we aim for. Every other day, there’s need of a technology solution that can keep us productive at all times and make planning & allocation of resources easier. Having difficulty in coordinating projects with remote workers? Looking for an easy way to manage workload, meetings and deadlines? Can’t find out availability of Project Managers before scheduling a meeting? All these worries can be answered with the use of an online calendar and task scheduler. In recent time, increased use of Internet-enabled mobile devices has given rise to the use of digital calendars. The useful features and intuitive designs of Online Calendar have caught attention of business owners, CEOs and employees alike. It is a most useful tool that a modern business can own to keep the workforce organized and efficient. Whether a person works as a freelancer or runs a company with 500 employees, having an online calendar simplifies task scheduling, catching up for meetings, booking time slot for appointments, making to-do lists, sharing a day’s plan with clients or team, and do a lot more. Online calendar is a lifesaver, as it adds more to efficient running of an office. Set up meetings and events in a centralized way by getting an overview of others’ calendars. If a user is connected to the Internet, Empxtrack online calendar will remain up-to-date regardless of which computer or hand-held device is used. All changes made on the calendar are accessible to all users in real-time. It is simple and easy to use and keeps a track of all upcoming events and tasks. » Get a quick glance of all activities through the day – for themselves and the selected team members. » Plan work for an entire day, week or month in advance. » Identify availability of others for meetings, appointments and important discussions. » Get reminders or alerts for specific events and tasks. » Keep a track of complete and incomplete tasks. » Effectively manage remote workers by remaining connected. » Share the calendar with people in immediate work circle. » Manage project-related tasks and meet deadlines efficiently. » Put personal and family appointments on the calendar to balance personal and work life. » Create recurring events and share with all participants in a click of a button. » Schedule events and notify all stakeholders through email. » Get notifications by email when any change occurs in the event schedule. 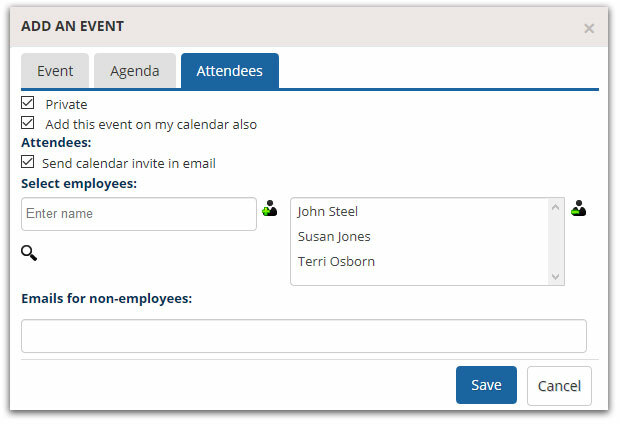 » Allow clients to access one’s calendar and block time slot for meetings, if required. 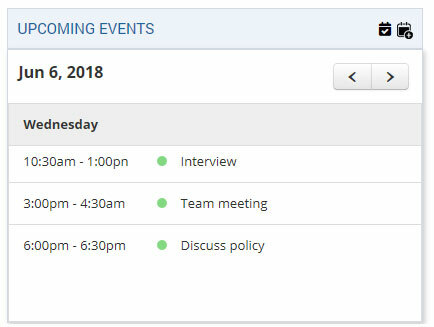 Any number of events can be set up for a specific day. Pick up a time that suits well for all the participants. The Upcoming Events section can be customized to view daily, weekly or monthly events, as per the needs. All the important events and tasks are mentioned on the respective dates. 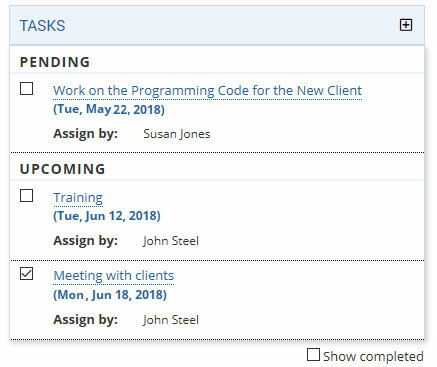 Users can select unique colour codes for specific tasks depending upon their preferences. A CEO can look through calendar of all Project Managers to check their availability and call for a meeting at a time that’s suitable for all participants. The online calendar even allows managers to mark an event in their subordinate’s list of events. Add an event in the calendar with details, including agenda, name of attendees, date, time and location. One can even notify all the participants through email. All you need to do is tick mark a check box. Though employees use goal sheets to manage their day-to-day tasks, yet some of them never bother to open them and see what’s needed to achieve. Managers can use Task Scheduler wisely to add tasks in their subordinates’ to-do lists to draw their attention on goals, which are important and not yet achieved. This can keep employees productive and goal-oriented. 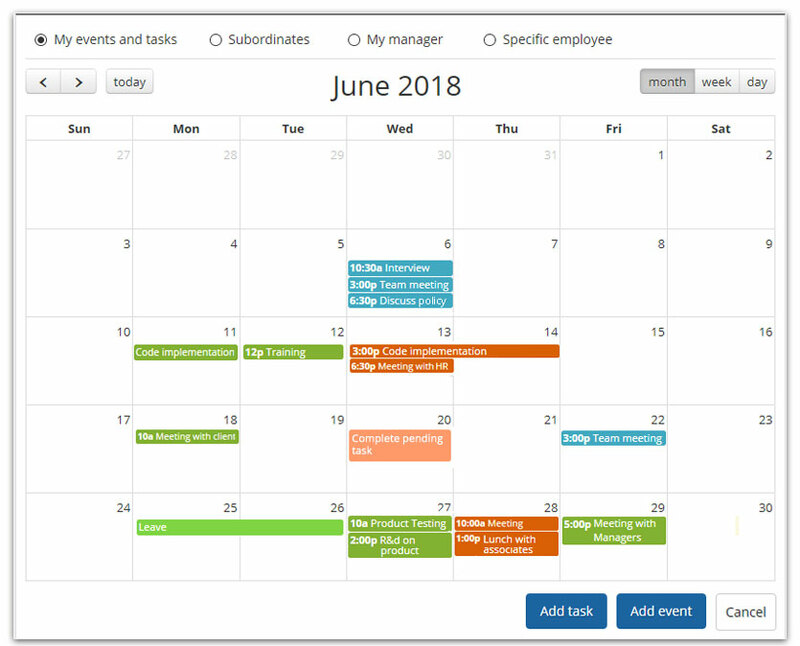 Empxtrack’s online calendar can be integrated seamlessly with all email clients to increase productivity and greater transparency when trying to manage events and tasks efficiently. 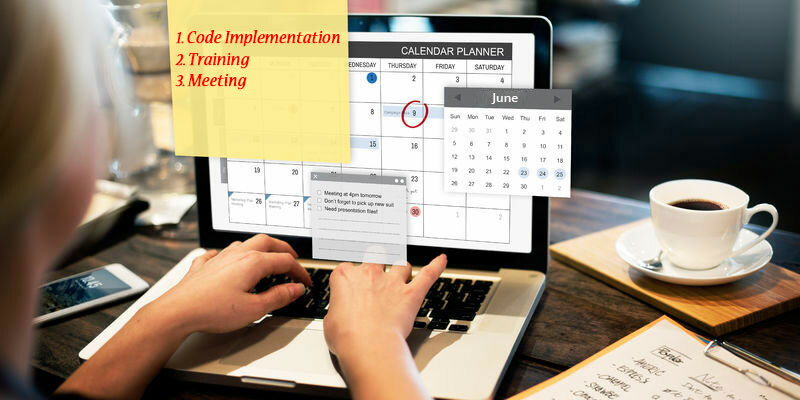 When setting up a meeting, the participants can be notified through an email too. Each user can allow other users to access their entire calendar or selected calendar items. Visibility and access rights can be controlled, as per the needs of individuals. For instance, a manager can see calendar details of their subordinates. However, the manager may use visibility rights to allow subordinates to view the entire calendar or just few items (like time and event). The access rights can be customized for each member of the team depending upon the needs. Every CEO or a manager has meetings and tasks that reoccur weekly, monthly or quarterly. Remembering them or putting reminders on cell phone isn’t a good idea. 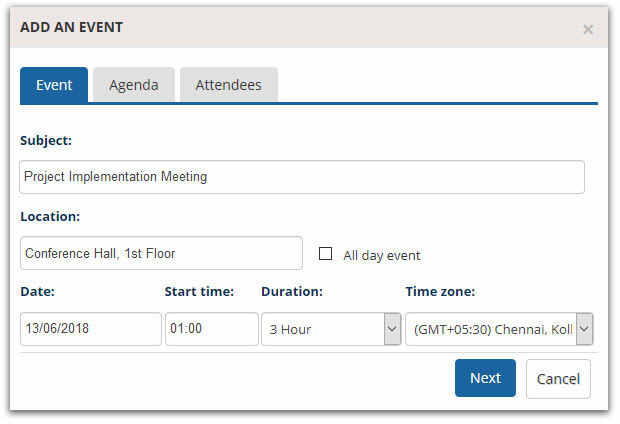 Create a recurring event and schedule it so that it is visible to all the participants. This task takes less than a minute. It even saves time to reschedule it each time and the need for everyone to remember the event. This means a person can also block their time slot to keep others informed about their availability and schedule. For instance, when a manager blocks a time period of 2 hours (from 3 P.M. to 5 P.M.) on every Friday to discuss team goals, employees remain aware about this recurring event and they participate in the meeting accordingly. Through the calendar, they may even see feasibility to request or book some other time slot for having a discussion or quick chat with their manager on Friday, when needed. In the last 20 years, work time has increased by 15% and leisure time has decreased by 33% in the corporate sector. This happens because people do not plan their work well in advance and spend their leisure time in completing pending work-related tasks. Use online calendars to plan your work by scheduling tasks and setting deadlines. Automatic reminders prompt employees whenever a task is delayed or left unfinished even after the deadline. This way the calendar and task scheduler keep users on toes to finish their work on time and track achievements in a timely manner. When it comes to work, every small task is important, and it takes up a significant amount of your time. A study found that 20% of the average workday is spent on “crucial” and “important” things, while 80% of the average workday is spent on things that have “little value” or “no value”. An online calendar and task scheduling tool can be used for prioritizing tasks. It ensures timely completion of high priority tasks, while assuring rest of the tasks are also done within the estimated timelines. It eliminates the need to go back and forth through work emails and choose what needs to be done first. With an overview to others’ calendar schedule, it negates the need to personally contact everyone for scheduling any meeting or an event. Just share your availability in online calendar to keep everyone in your immediate work circle informed. Having an easy to use online calendar and task scheduling tool helps in keeping a track of all upcoming events and tasks. It allows you to be better organized by staying in sync with all your team members. Would you like to get an online business calendar? Contact Empxtrack!